You have landed on the best page for the latest Pappadeaux menu prices. Pappadeaux Seafood Kitchen is a sit-down dining restaurant that specializes in seafood and Cajun-inspired dishes. The Pappadeaux menu also includes a variety of appetizers, soups, salads, steaks, and desserts. For guests planning a Lunch visit, there is the special lunch menu along with the regular menu. All locations are open for lunch and dinner. Reservations are recommended if celebrating a special occasion or dining as part of a large group. Below are the latest Pappadeaux Seafood Kitchen menu prices. Live Maine Lobster Market Price per LB. The best way to offer the Cajun-inspired tastes of the French Quarter is to give a Pappadeaux Seafood Kitchen gift card. Sending gift cards is simple. Guest can order gift cards online and have them emailed to recipient’s inbox instantly or they can order plastic gift cards and have them delivered via postal service. The best way to receive exclusive offers and special deals to Pappadeaux Seafood Kitchen is to join the E-Club. All offers & deals will be delivered to an email inbox. Guests will also get the latest news and menu additions. Searching for a location to hold a social gathering or corporate event just got easier. Pappadeaux offers well equipped private dining rooms and several menu plans. Planning the event is taken care of by a Pappadeaux event coordinator. Pappadeaux Seafood Kitchen makes it simple for families to enjoy their Cajun and fish menu dishes at home. With their special to-go menu, guests phone in their order and select a pick-up time. Reserved To-Go parking spots make it quick to pick up orders. The best way to bring the flavors of the French Quarter to any event is to have Pappas Catering take care of the menu. No matter the event or number of guests, Pappas Catering will ensure guests will leave happy and full. From special catering menus to on-site grilling, let Pappas Catering make any event a resounding success. Pappadeaux Seafood Kitchen & Pappas Restaurants believes in giving back to the community. Pappas Restaurants sponsors local charitable organizations such as Boys & Girls Club, Periwinkle Foundation, Prepared For Life, and local food banks. Employees are encouraged to volunteer and raise funds for causes they believe in. Pappadeaux Seafood Kitchen is always on the lookout for self-motivated, high energy candidates that enjoy great food and providing exceptional customer service. Head over to the Career section on the Pappadeaux official website to learn about entry-level, management and corporate openings. Be sure to read up on Pappas Perks and advancement opportunities. Pappadeaux Seafood Kitchen was started in 1986 by Chris and Harris Pappas. Pappadeaux Seafood Kitchen is part of the Pappas Restaurants group of concepts. 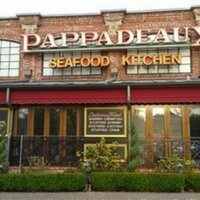 Today, there are over 25 Pappadeaux Seafood Kitchen locations across the U.S. Pappas Restaurants is headquartered in Houston, Texas and includes 8 different restaurant concepts. Stay connected with Pappadeaux Seafood Kitchen through social media. For more information about Pappadeaux Seafood Kitchen locations, news and the latest dish creations, visit their official website. Do you have deep fried Cod?